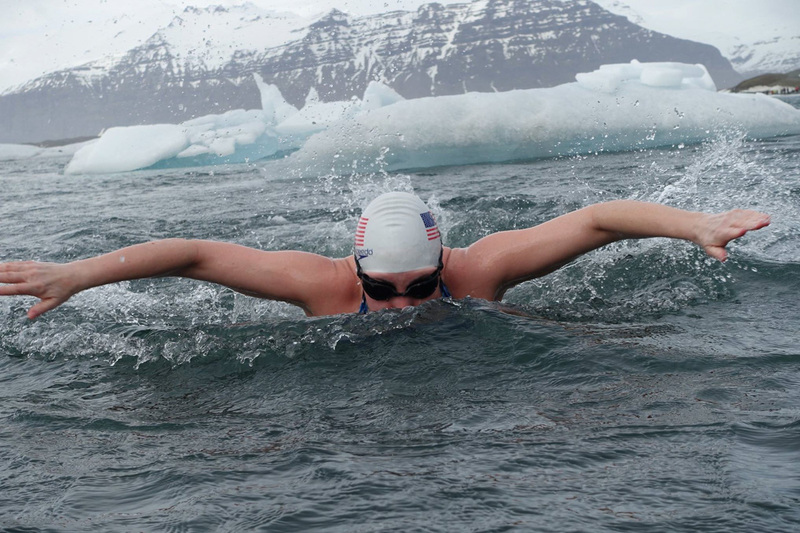 Jaimie Monahan is an extreme swimmer in icy waters – from Siberia to Antarctica. Jaimie Monahan from New York is a most particular swimmer. 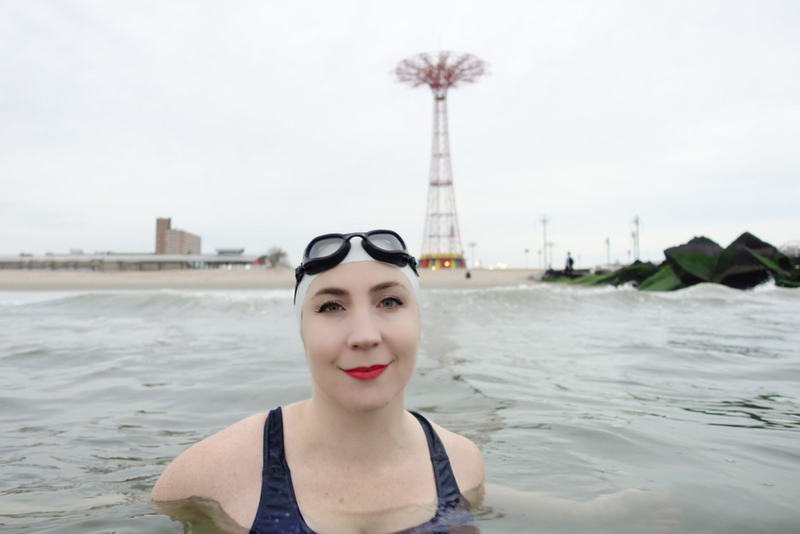 The seven-time US champion in winter swimming and first winner of the World Cup of the International Winter Swimming Association is also the first successful female Ice Zero swimmer. In this competition, the few successful swimmers are on the move in extremely cold waters. The 39-year-old was the first person ever to complete the International Ice Swimming Association’s Ice Sevens Challenge. 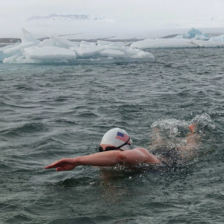 To complete the Ice Sevens, Jaimie completed seven stages of one mile each as an ice swimmer in open water in just over a year. No water may be warmer than 5 degrees Celsius, measured by three thermometers. Whoever starts must present a health certificate together with a favourable ECG, followed by the video proof: For starting, in between and at the end of the stage, the jurors must be presented with videos. The aspirants have to cover their ice miles in Europe, Oceania, Asia (including Russia), North America, South America and a polar region (at or below 60 degrees south latitude or over 70 degrees north latitude). An additional challenge is that one of the seven stages must be a documented Zero Ice Mile. The challenge is to swim at or below 1 degree Celsius water temperature. No problem for Jaimie Monahan from the Big Apple. On her regular long distance trips, Monahan has discovered new swimming routes and set course records in some of the most beautiful and famous places in the world. float magazine has talked to Jaimie Monahan about her sport. What motivated you to swim in icy waters? I’ve been a swimmer all my life and an open water swimmer doing marathon swims up to 93 kilometers and 33 hours in duration for the past 10 years. About five years ago I learned about the sport of winter swimming and was intrigued. I began to train outdoors in the sea year-round and really enjoyed it. I began to compete in events around the world, from frozen lakes in Siberia, to Argentina’s Perito Moreno Glacier, and even to Antarctica! After a few years I started to design my own personal expeditions to challenge myself and explore the world’s most beautiful and extreme landscapes through swimming. My heroes in the sport are Lynne Cox, the amazing pioneer cold-water swimmer and writer, and the record-holding ice freediver Johanna Nordblad and her talented photographer sister Elina Manninen. I love how they use their personal goals to explore and enjoy the world’s waters, push boundaries, and create beautiful art from their experiences. 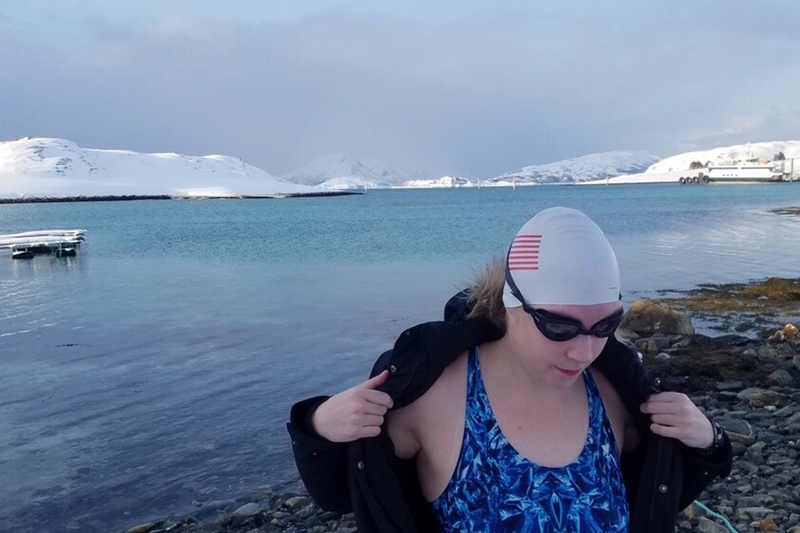 I’ve been very fortunate to have the support of both the International Winter Swimming Association and the International Ice Swimming Association for my swim endeavors. On the personal side, my partner, Arik Thormahlen, has been around the world with me for my swims on all seven continents and I always swim happier knowing he is by my side. How and how long are you preparing for these cold challenges? 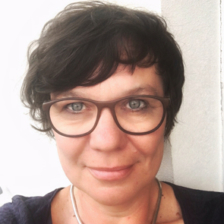 I train during the week in a regular swimming pool, and supplement my training with vinyasa yoga, weight training, running and high intensity interval classes. At weekends I swim outdoors year round. It’s an ongoing process with no off-season, but I love it. What is needed to protect your body and skin? I wear nothing but a textile swimsuit, a single silicone cap, goggles, and earplugs.